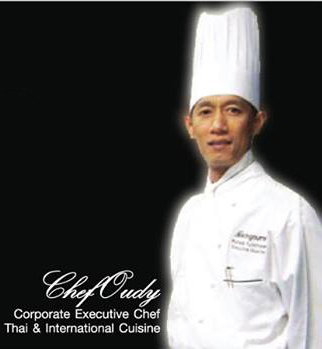 With more than 25 years of experience, and an extensive, diverse background in Fine Dining, Airline Catering, VIP Events, Private Consulting, Celebrity Chef and Personal Decor, owner/Executive Chef, Punsak Puncharoen, professionally known as “Chef Oudy” (woo-dee), has enticed the world with his culinary prowess and fine art creations. Born in Bangkok and brought up in the deep traditions of Thai cooking, Chef Oudy left his home at 17 to commence his formal culinary career and to travel the world. While working in the finest restaurants, creating innovative menus captivating the eyes as well as the palate, Chef Oudy, ever the teacher, always the student, eagerly shared his knowledge while increasing his own breadth and depth by immersion into the subtleties of the many cultures he encountered. These skills have been recognized by such prominent public figures as actor/California Governor Arnold Schwarzenegger who in 2005 awarded Chef Oudy for his “Culinary skills, Creativity and Authentic taste” and most notably by the Royal Family of Thailand who twice chose Chef Oudy to organize exclusive events for the Prince and Princess during official visits to the U.S.
With a desire to make his own mark, Chef Oudy presents his latest creation, Noodlefan, will personalize your dining experience. His dishes are rich in traditions, taste, and aromas of Thai cuisine but with the quality and presentation of the finest Continental restaurants. This obsessive attention to detail and exacting quality does not end with your meal. Chef Oudy oversees every detail of lighting and décor ensuring his artistic vision extends to every inch of Noodle Fan locations, caressing each of your senses. By combining fresh ingredients, a wealth of experience and a passion for the personal touch, Chef Oudy’s Noodlefan dishes will seem familiar yet exciting, like your first kiss revisited. The success of the first and second restaurants is a testament of Chef Oudy’s ability to create healthy dishes rich in tradition, taste and aroma.